What we believe has a huge effect on our lives and bodies. Imagine adapting beliefs that are actually useful and make our lives easier. Neurolinguistic Programming (NLP) creates a list of such beliefs and calls them “presuppositions” (as in “suppose that they are true unless, in some rare case, they prove not to be”). In this month’s series, we discuss these NLP presuppositions for MS that you can learn to live by and how they can help your heal. NLP is the science of changing these maps (not reality). These maps are our individual interpretation (through our beliefs) of events. By focusing on changing our map rather than the event or person that we feel is creating the problem, we can create a true change in our lives for the better. Another way of working with this presupposition is to realize that the map of every one of us is very different and thus each of us experiences the same events or conversation very differently! Communication is not about saying the right words but about the reaction of the listener. What is your listener’s map like? What do they value, sort for, believe in? By focusing on the other rather than on how eloquent we may sound, we can modify our communication until we get the response we desire. Failure is a common fear of my client’s with MS. There is an underlying belief and life strategy around “if I can just do this successfully or perfect, then everything will be ok.” But focusing on avoiding failure at all cost and on getting it right every time creates elevated levels of stress and high standards impossible to achieve. What if our focus was not on avoiding failure at all cost but on testing, being persistence, learning, and growth? One of the fears many of my clients with MS comment is that they will become worthless if they end up in a wheelchair. “Who will love me if I’m just a sack of potatoes!” They measure their self-worth from their behaviors and ability to do physical things for others. Part of the reason for the illness could reside in the fact that they always made their needs and their body’s needs the sacrifice to this constant need to prove themselves as well as their harsh judgments of themselves when they didn’t meet their own high standards of behavior. This NLP presupposition invites you to separate your behavior from your identity. No matter how ‘able’ you are or how many mistakes, regrets, lazy days you take, you are still you and that is what is valuable. Similar to the fear of failure, insisting that ‘I have to get this right’ will lead to greater stress. To be willing to experiment, find other choices and be flexible in our thinking will likely help us achieve our desired outcomes. We’ve all regretted something we did or didn’t do. That is normal. But we need to remember, as this presupposition suggests, at the moment of the decision, we made the choice we thought was the best choice with what we knew then. In hindsight, we know differently, but at that moment, we took did our best. Translating this presupposition, I would also say that there are no unworthy/unlovable people that are incapable. Just occasionally, we can act or appear un-loving or un-valuable. But these are only states that, through another action, can be changed. This NLP presupposition also tells us that, just because we felt unresourceful or incapable in a certain event, doesn’t mean we are incapable people. We just need a better resource in those types of events. Again, our behaviors or the state we are in at a particular time does not define us. One option amounts to no option; two options may present a dilemma (conflict, regret); three or more options give you a lot of control (flexibility) to achieve your goals. Your subconscious will move towards what you are clear about and away from confusion be it negative or positive. Be very clear about your desired outcomes states in the positive (increasing your balance, having energy, walking for longer periods of time), not what you don’t want (the fogginess, incontinence, MS). Worry and envisioning the worse thing that can happen every time will not help you find the many options to create health. Neurolinguistic programming studies structures. Use the structures that work and modify those that don’t. Notice when your symptoms are worse and when they are better. Can you find patterns that drive your symptoms? Do naps help? What about taking supplements for 30 days? If one person can do something, it is possible to model it and teach it to anyone else. Observe the patterns others use to heal their MS and then test them on yourself. Don’t stick with what they say they do, understand their full story and observe their daily structure and model those. You’ll notice that even those that claim that parasites or gluten was the cause of their multiple sclerosis, actually do a lot more things to maintain their health each day that just that one change. Anything can be accomplished (by anyone) if you break the task down into small enough chunks. When Palmer talked about the elimination diet, everyone at the presentation went on overload. Remember that it is not necessary to do all the health changes at once. Doing that would actually create additional stress and you wouldn’t notice the benefits of the changes you are making. Instead, chunk it down. Start slow, gain a few habits before introducing more changes. It took a long time for your body to develop multiple sclerosis. You can take time to heal from everything that contributed to it. It can be done and it takes time and small increments of change. Some of my clients fall into the belief “Others have the ability to succeed in healing their multiple sclerosis. But not me.” This presupposition invites you to think differently. You have the ability and the resources to succeed. We just need to become aware of them or create them. If you’ve spent a lot of time and money and still no change in your MS, you have not failed. You just haven’t tapped into the resources that work for you. Keep researching and testing. Hold the belief that your body is not broken. It is working perfectly to produce the results it wants for you to listen to it. If you don’t like the symptoms, figure out what your body is wanting for you and make those changes. Your symptoms will lessen and often times disappear. It’s not wishful thinking. It’s cause and effect. Symptoms (pains, anxiety, depression, tumors, colds, etc) are communications about needed action. Mind and body are one system. Whatever happens to one affects the other. It is not possible to change one without changing the other. NLP for MS invites us to listen and take action. Remember that sometimes that action your body is requiring from you is for you to say “no” to things you really don’t want to do but feel obliged to do for others. 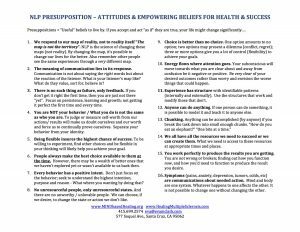 You can download this list here – NLP Presuppositions for MS.